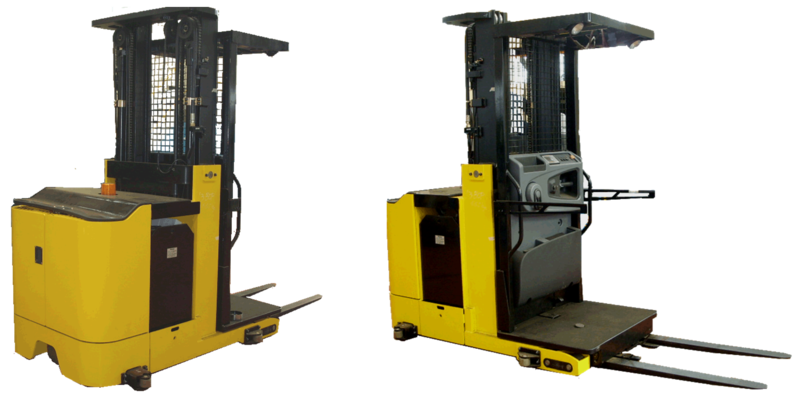 An order picker, also known as an “order selector”, “stock picker” or a “cherry picker” is a man up forklift truck. An order picker is one of the most convenient tools for shipping centers and allows mixed product pallets to be put together quickly and efficiently. This is because the operator actually rides up on the platform so that his feet are at the same height as the forks at any given time. This machine is used in warehouses to “pick orders”. In other words, the operator will go up to the level that the product desired is stored and physically pull the items desired and place them on a pallet or platform that is sitting on the forks. Late last week, Hyundai Construction Equipment Americas announced the availability of the new Hyundai Orderpicker line. The line consists of two different capacity units. 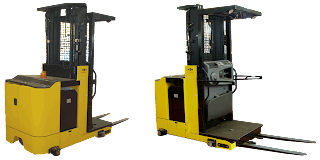 The 10BOP designed for a lifting capacity of 2,200 lbs and the 13BOP at 3,000 lbs capacity. Both units are designed with the state of the art AC electric systems and controls. Similar to the other AC powered electric units offered by Hyundai Forklift, this unit incorporates the ZAPI AC control system. Unique to this control system is the ability to adjust parameters for regen-braking, plugging, performance modes anti-rollback features. The onboard self-diagnostic LCD monitor not only allows you to monitor speed, battery discharge level and the hour meter but is also displays the alarm codes and diagnostics display. The availability of this information allows for troubleshooting and adjustment of the equipment without a laptop or handset. These units come with the option for two or three stage masts. The available mast sizes range for 128” all the way up to 366”. These masts have also been designed for high visibility through the mast opening. The Orderpickers can be outfitted with 36 or 48 volt industrial batteries, which allows for long and strong operating periods. Good question Mark. Guide rails are not required but in cases where the aisle is very narrow and it is difficult for the operator to navigate successfully. 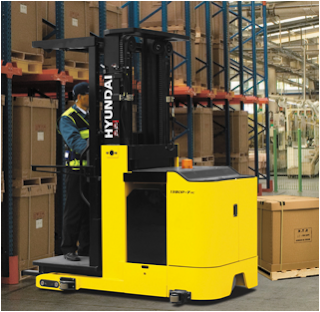 The Hyundai forklift has the ability to work in both modes. As for the turning radius, I would suggest 12-15 ft.
Magazine Flow created by Themes by bavotasan.com.